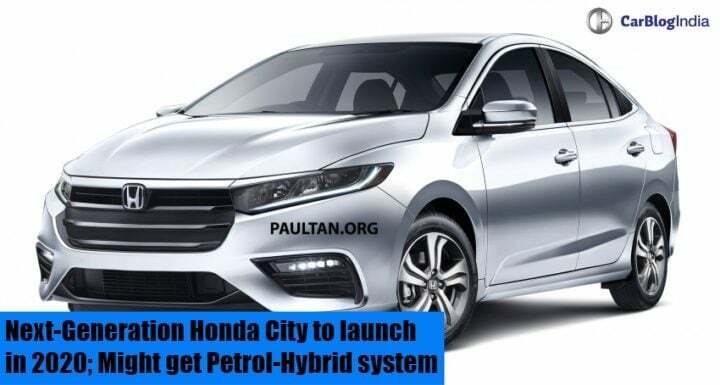 New Honda City is going to launch in 2020, after the new BS-VI emission norms kick in. It might get a petrol-hybrid version in the future lineup too. It will likely get a sharper and bolder design, similar to the upcoming Honda Civic. Currently, you can say that Honda City and Amaze are the most important models for Honda Cars in India. Amaze received a new generation update this year and has climbed its way in the top-10 selling cars of India. Well, City is also not lagging far behind the Amaze. The Honda City got its last update in 2017, which came as a facelift. Now, media reports say that Honda Car India is readying the New Honda City. It is going to hit the roads in 2020, once the new emission norms kick in. Honda is going to update its petrol and diesel engine as well for the BS-VI rules. Along with the next-gen city, City might also get a new petrol-hybrid version or might offer it as a standard fitment with the petrol engine. Also Read: Honda Civic is coming back to India in February 2019! Like the Ciaz, the New Honda City will use a mild-hybrid technology. Global Honda cars are fully hybrid, which are much costlier than the mild-hybrid system. However, Autocar India states that the decision of petrol-hybrid technology depends on the policies of the government. Earlier, Honda used to offer CVT gearboxes only on petrol engines. However, for the first time, CVT was offered on a diesel variant. It was mainly done because its bitter companion, Dzire offered one. So, like the Amaze, the New Honda City can also come with the diesel-CVT combination. Honda City is one of the most feature-equipped sedans in its segment. The next-generation City might get features such as LED Projector Headlamps, Automatic Headlamps, Rain-Sensing Wipers, Multi-Functional Steering Wheel, Adjustable Steering Wheel, Electric Seats, Keyless Entry and Push-Button Start-Stop. For safety, it might come with features such as Dual Front Airbags, Side And Curtain Airbags, Reverse Parking Sensors, ISOFIX Child Seat Mounts, Traction Control and Electronic Stability Program. Currently, it comes with dual front airbags with ABS and EBD as standard fitment. For performance, the New Honda City might continue with the BS-VI versions of 1.5 Litre i-VTEC petrol and 1.5 Litre i-DTEC diesel engines. The petrol engine produces around 119 BHP of power and 145 Nm of torque. The diesel variant produces around 100 BHP of power and 200 Nm of torque. Currently, the petrol engine comes mated to a 5-speed manual transmission with an optional CVT and the diesel engine gets a 6-speed MT. In next-gen, the diesel engine might get optional CVT. Lastly, we expect the prices to increase a little bit. Currently, the City petrol variant starts from Rs 8.77 Lakhs and goes up to Rs 13.80 Lakhs. The diesel variant starts off at Rs 11.10 lakhs and goes up to Rs 13.92 Lakhs (ex-showroom New Delhi). So, overall, we expect the prices to rise by around Rs 30,000 on each variant. By 2021, Hyundai Verna is also expected to get a new generation update. Actually, in a course of 4 years, a lot of cars in its segment or even outside its segment might get a generation or facelift updates.